Topshop Mini is the go-to destination for trendy Mum’s looking to outfit a stylish mini-me. 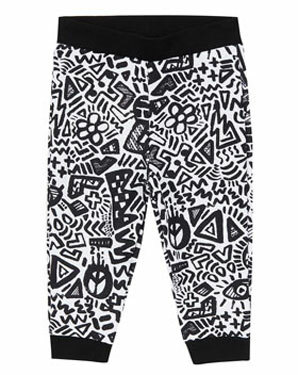 These Mini-Graffitti Joggers have a very cool eighties look with a definite Keith Haring-inspired design and monochrome colour-way and if you want to go all out there’s a matching sweatshirt too. The joggers come in a sizes 3-6, 6-12 and 12-18 months and cost £15. Check them out here.